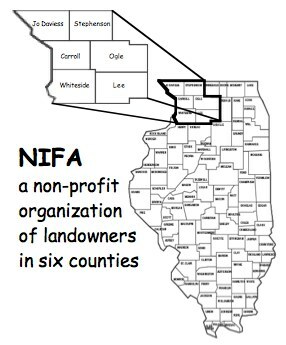 NIFA is a non-profit organization incorporated in 1986. Our self-organized, self-supported, and self-run organization started as a six-county organization, but now have members statewide. The six counties where we primarily focus our activities are Carroll, Jo Daviess, Lee, Ogle, Stephenson, and Whiteside in Illinois. As a not-for-profit group organized to educate, and further the interests of, its members, the Forestry Association looks for various ways to accomplish its goals. During the winter months of November through February, we hold meetings on the second Tuesday in Stockton, Illinois. In November and December, we plan our agenda for the next year and hold elections. In January and February, we host speakers on a variety of subjects related to landowning and forestry. In March, we gather for our annual dinner meeting in Mount Carroll. Following dinner, there is a slide show of the year's past events, a featured speaker, presentation of awards, and distribution of door prizes. In March, in addition to the dinner meeting, our members assist at the Tri-State Forest Stewardship Conference in Sinsinawa, Wisconsin - a day-long seminar of elective sessions that supplement our field days and meeting speakers. From April through October, we host field days at members' tree farms, at area businesses related to forestry, and at natural resource areas featuring forestry or wildlife. We have also hosted educational events, such as chain saw safety seminars, wood utilization seminars, and forums on tree diseases and pests. As soon as we have sufficient information, we post our events on this website. Beyond these meetings, field days, and educational sessions, we publish a booklet that markets products that our members derive from their forests as well as forestry services that our members provide to other landowners. This booklet also includes information about forestry practices. In addition to our officers (president, vice president, treasurer, and secretary), we elect six directors - each to two-year terms. We attempt to find candidates that represent each of the six counties in our membership area. For a membership form, contact us at HERE . Membership dues are $15 if we can send our newsletter to you via email, or $20 if you wish US Postal Service delivery of our newsletter.